Welcome to the Two East Congress Blog! 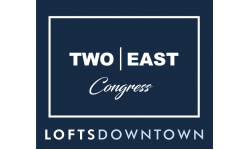 In this week’s post, we are excited to highlight Two East Congress, our stunning downtown lofts available for rent. Right on Congress Street and Stone Avenue, Two East Congress is centrally located within close proximity to many of the wonderful sights, sounds, and atmosphere of the Tucson, Arizona downtown scene. Because we are close to public transportation, residents are able to traverse the city to reach city amenities beyond walking distance of Two East Congress. Our central location is one of the premiere perks of being a resident at our luxury lofts, as being close to the action makes life more convenient! With restaurants, shopping, and other activities within minutes of your front door, you’ll have plenty to do and see! If you enjoy driving or need to have a vehicle for your commute to work and other destinations, you can take advantage of our covered parking available for residents of Two East Congress at our sister property, One East Broadway, a short walk from your home (parking rates apply). As a resident, you will also have access to the amenities of our sister properties, One East Broadway and One West Broadway, with their fitness center, rooftop deck with a gas grill, and community lounge! Once you’ve taken a look at our floor plans and photo gallery, contact us, come into our leasing office, or apply online now! Come see for yourself exactly why Two East Congress can be your perfect home!